Blueshift provides several options to execute your campaigns over different channels using your choice of best-in-class providers. 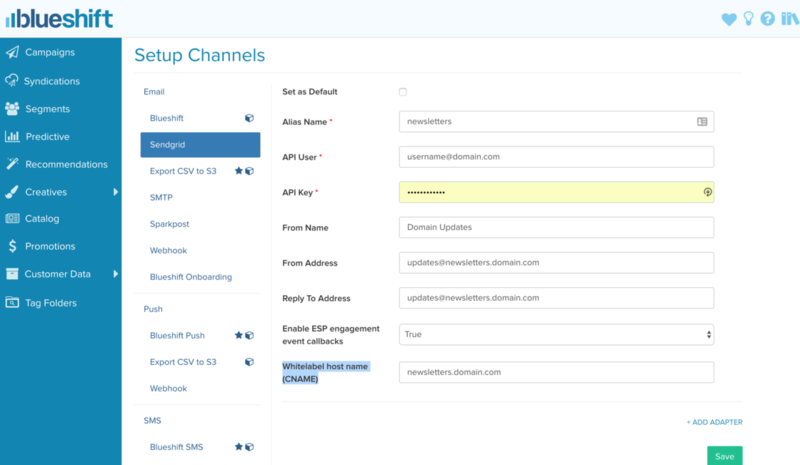 To get started navigate to Setup Channels from within your Blueshift dashboard. 2 - If you are using Blueshift’s ESP sub-account, we will create dedicated domain/subdomain(s) plus IPs and have you whitelabel them in your DNS provider settings. You can customize the CNAME used in email link redirection per adapter. The change allows you to brand your links and drive better deliverability by aligning the redirection links with the FROM name in email headers. In order to setup the CNAME, go to account adapters and customize the "Whitelabel host name (CNAME)" for the relevant adapter. If a CNAME is not setup at the adapter level, it will default to the account level CNAME. Netcore is another ESP which can be integrated using SMTP. Go to the SMTP option on setup channel page and give any alias name for this adapter. Enter the username, password and sender address as provided by your Netcore ESP support team. The other fields are as follows. After setting up the adapter, validate by sending a test campaign using this adapter. Then, paste the url https://api.getblueshift.com/netcore_smtp/events under Global APIs. Whitelabeling adds a CNAME record for a subdomain that you choose, which masks click and open-tracking links to your domain, rather than a Blueshift domain. This increases deliverability, builds trust, and strengthens your brand in your emails. In order to use that, you should setup a CNAME in your DNS provider for your sub-domain (example: links.yourdomain.com) with a CNAME to api.getblueshift.com. After creating the DNS entry, head over to Blueshift and enter the CNAME (example: links.yourdomain.com) in the CNAME field . Blueshift supports email webhooks where you can publish the rendered payload to your own URL (webhook). The message body contains attributes specific to the campaign along with the content attribute which will have the raw html of the message which was generated. We don't use an intermediary and connect directly to APNS and GCM. To setup push, we assume you have an app already. Thus, all you would need is to enter your app certificates. We currently support integration with Twilio and Gupshup only. Simply enter your SMS provider's credentials to enable SMS.